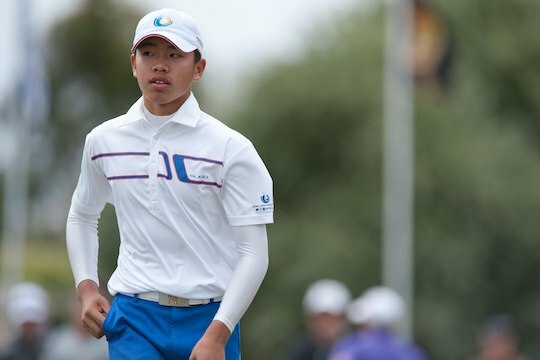 If you were at the Australian Master of the Amateurs, you could tell it was only going to me a matter of “when” not “if” 14-year-old Tianlang Guan would get penalised for slow play. Slow play is the scourge of golf and during today’s second round at the Masters was Guan, the youngest player in Masters history, was dealt a one-stroke penalty on the 17th fairway. He is the first player in the 77 years of the Masters ever to be penalised under Rule 6-7. He joins Sam Randolph and Ed Fryatt from the US Opens of 1987 and 1997 as only the third player to receive such punishment. There is no doubt Guan is slow and deliberate in his preparation and pre-shot routine. We witnessed that during the opening round of the Australian Masters of the Amateurs at Royal Melbourne when Guan’s group finished over 45 minutes behind the group in front – the delay squarely the fault of Guan as he deliberated with his caddie every aspect of the shot and took numerous pre-shot swings before even addressing the ball. Tournament officials at the time reprimanded Guan, placed him on clock for the remained of the tournament and reiterated the importance of keeping the pace. Obviously Guan did not take heed to the warning. During today’s round Guan was also warned several times on the back nine and English referee John Paramor, the chief referee on the European Tour, said he had no choice but to issue the one-shot penalty. “That’s my job. That is what I do,” he said, adding that Guan’s age made no difference to his decision. “No, because it is the Masters,” Paramor said. Guan was asked if he thought he was the only slow player on the course. “I don’t know what they do, but I don’t think I’m too bad,” he said. The penalty turned Guan’s score on No. 17 from a par into a bogey, and left him with a second-round 75. He finished at 4-over-par for the tournament.